Size of Male: 25-35 lbs., 16-17 in. Size of Female: 20-30 lbs., 16-17 in. The Puli dog (plural Pulik) is a very old breed from Hungary. They have been used to herd sheep for over 1,000 years and are related to the Kuvasz and the Komondor dog, also from Hungary. The Puli dog is affectionate, intelligent and home-loving. These dogs are immediately recognizable by their mop-like cords, usually black. They make an excellent family dog. Ancestors of the Puli dog were brought into the area now known as Hungary over a 1000 years ago by the Magyars when they first settled the area. These dogs were also the ancestors of the Kuvasz and the Komondor dog, other herding and livestock guardian breeds native to Hungary. Pulik are the smallest of these dogs and they are most often black. Shepherds seemed to favor this color for them so they could be easily distinguished from the sheep they were herding. These Hugarian Water dogs, as they are sometimes known, were almost extinct in the 17th century because of interbreeding with the other herding breeds. They were brought back in the early 20th century by careful breeding. The Puli dog is considered to be a very affectionate dog. They are intelligent and they love their home and family. They are devoted to their owners and can bond very closely to them. This dog breed has a natural suspicion of strangers and makes an excellent watchdog. They’re always alert and they are naturally protective. This breed is also very playful and can have a “puppy” attitude throughout their lives. Dog training is usually easy for this breed and they can do very well in obedience and other dog activities. They are extremely agile and make excellent agility dogs. They are both sensitive and sensible, fun-loving, courageous, tough as nails and they can be headstrong. These dogs can be obstinate at times so it’s best if they have an owner who is equally strong. Make sure you provide good socialization for them so they will be accepting of friendly strangers and other pets. These dogs do make excellent family pets. Living Environment – The Puli dog can adapt to living in an apartment if necessary but they much prefer having their own yard. These dogs need plenty of regular exercise. If they don’t get enough exercise they can become restless and destructive. They do not do well as kennel dogs. Grooming – Grooming these dogs is a challenge. Cords begin to form on a puppy’s coat at about the age of six months. Instead of brushing, the cords should be separated by hand, with mats and clumps being sorted out. Once the cords are formed and growing, the dog should not be bathed too often. Drying takes several hours with a blow dryer. If not fully dried, the coat can mildew. Without a dryer, drying time can take a couple of days. The breed does not otherwise shed. Keep the bottom of the cords trimmed so they won’t be straggly. It takes about two years for cords to grow out to reach the floor. Diet & Exercise – Dietary needs are normal for this dog breed. They can be prone to put on some extra weight, so measure their food portions carefully. These dogs are very active and they need lots of exercise. Daily walks are encouraged. They will also enjoy having a good run in a safe, secure area. They enjoy having their own yard to patrol. If they don’t get enough exercise and activity they can become destructive in the home – and they can be very creative with their destruction. Health – Pulik are a generally healthy dogs. They can have problems with canine hip dysplasia and with some dog eye problems. If you are interested in this breed you should talk to a breeder about possible dog health problems. 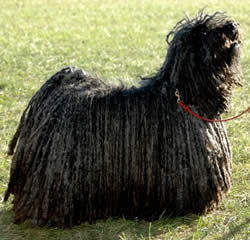 The Puli dog is a very intelligent breed of dog but they can be independent and strong-willed. They will make their own decisions if they don’t think you are in charge. Dog training usually goes much better if you begin early. You should be firm but gentle with these dogs. They are very smart and they have a good sense of humor, so make training fun for them. The more fun training is, the better they will learn. Use positive dog training methods (praise, reward) and your training should go well.